Home > Commercial-Land Mobile-Marine > Uniden > BP-294xe : 7.2 volt 2000mAh NiMH ENELOOP battery for Uniden SPH21, SPU21, etc. PRE-CHARGED & READY TO USE. The BP-294xe is a 7.2 volt 2000mAh rechargeable battery pack. Made with eneloop NiMH cells - arrives to you CHARGED and READY TO USE. Fits in Bearcat-Uniden radios such as SPH21, SPU21, SPUH21, etc. Replaces battery #s BP294, BBTY0294001, BT294. 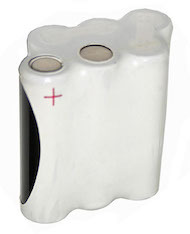 This battery pack is manufactured in the U.S.A. by Batteries America, and is made to order. It provides superior running time, and retains its charge when not in use.